That title implies that I would be showing you a completed nursery, right? Well, it is complete to a degree. The crown moulding is in, we’ve put down a carpet and the baby has moved in. But, I’m still painting. Yes, it does take me that long. I’m working on a Peter Rabbit mural for the nursery and now that little guy is napping in there, I can only work in bits and pieces. However, here are the pics of the room so far. 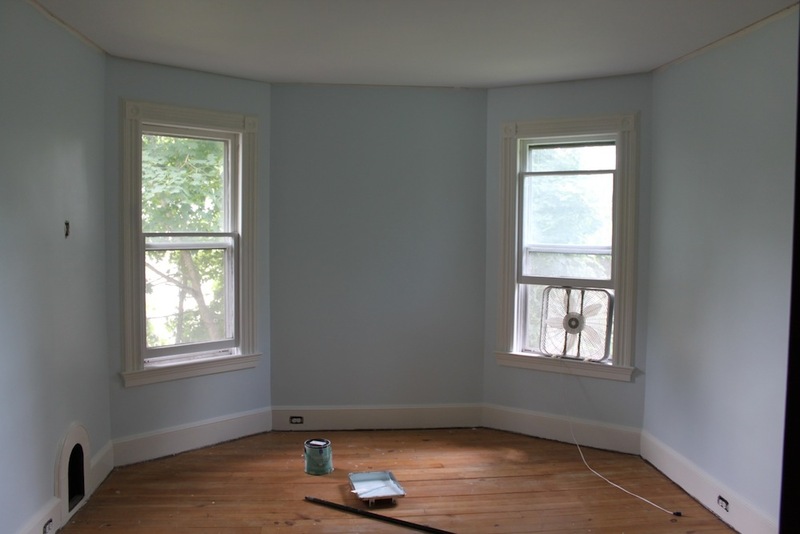 We finished painting the room a light turquoise and then readied the closets. I decided to paint them a bit darker than the walls. 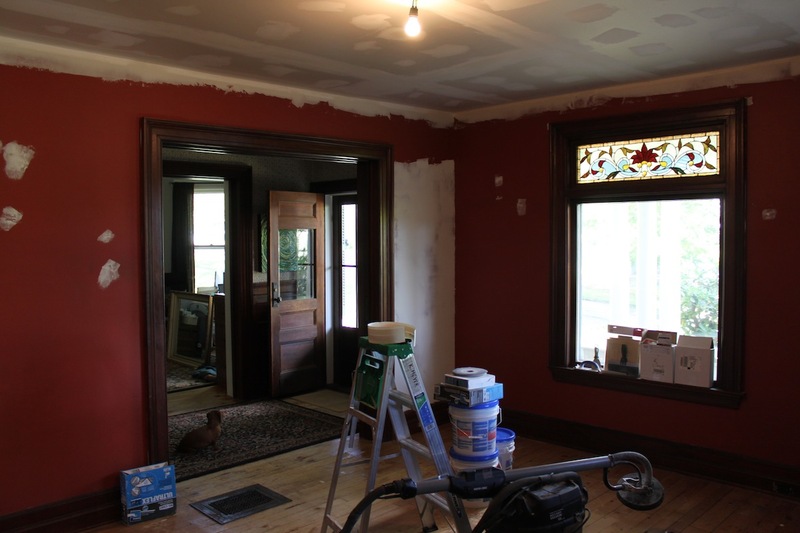 Previously, we thought we could line them both with pine and/or cedar and call it done, but the expense kept us on the original plan just to re-plaster. My father had removed all the wallpaper in them during the winter, so they were completely bare. Bill re-plastered and built shelving and I primed and painted. In the meantime, we shopped for a carpet. To keep the dust at bay and the baby healthy, we have decided to wait on refinishing any floors right now. Course, this drives Bill crazy, but it keeps us moving along on getting plaster work done. . . and has given Bill motivation to work on other wood projects (such as our mantel). 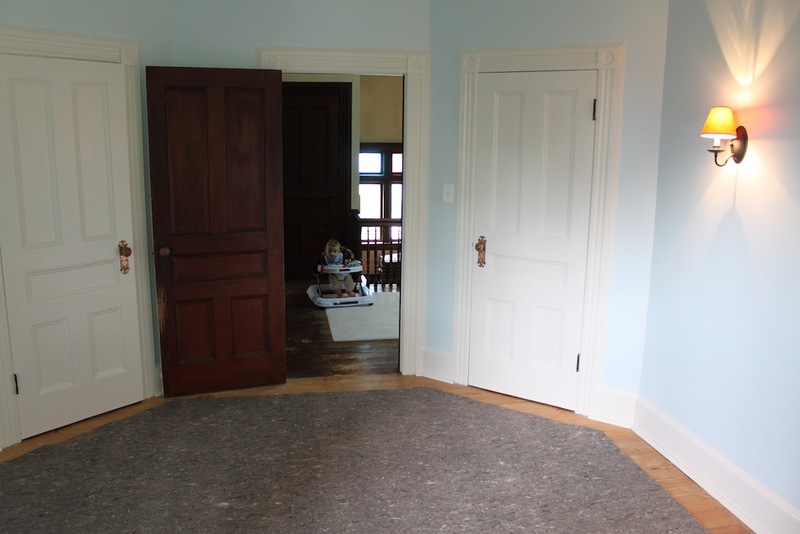 So, the room has a full rug, which was hard to shop considering the room is shaped like an octagon. We ended up purchasing a rug that was custom cut. . .but the store had to do it twice to get it right because the room isn’t square! Crazy hard. All in all, it is a clean comfy nursery space at this point, but not as fun as it is going to be. 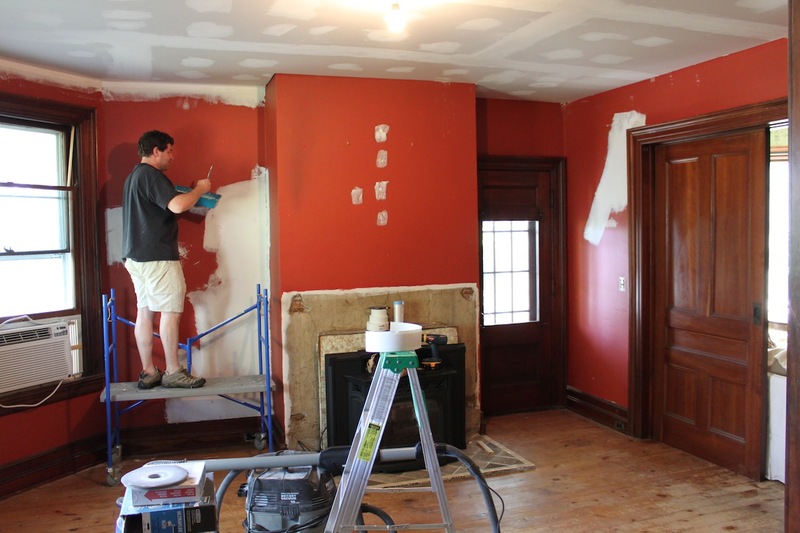 While I’m painting away on the nursery (and finishing stenciling in our bedroom), Bill has moved on to plastering the living room. As you may remember, the ceilings have been sheet-rocked. So, he is working on the walls and seams. The woodwork in there is all cherry, which we love, but this will mean that any additional work we do will need to match. Well, we would want it to match. Eventually, we would like to do a crown/picture rail moulding in there to formalize it. However, the main woodworking project we need to complete is the fireplace mantel. It is currently pine, and we are thinking that it is original, but we aren’t sure. It looks to simple to be Victorian, and yet, we found a matching mantel in oak online that dates to 1890. So, we are debating whether to improve the piece we have by wrapping it around the stove more carefully or to build an entirely new piece that would go up the wall. Any thoughts on that? My favorite thing in the living room is the side door. 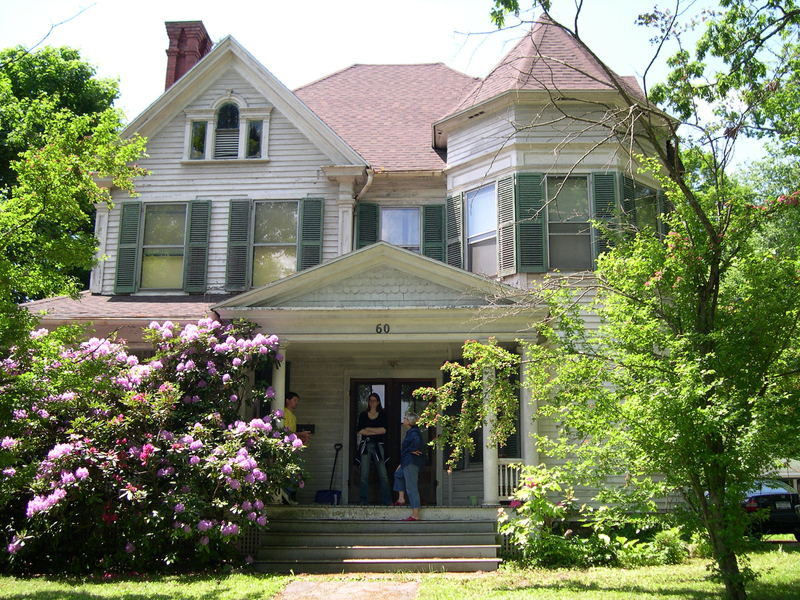 It leads to the porch, which is the front porch that wraps around, but the door is mottled with shellac and old stain. I love it! I don’t want to refinish it at all, because the patina is so beautiful to me. However, Bill might win out. It should be refinished to complete the house and care for the wood. Sigh. (I like this door even more than the stain glass in the front window). So, this is our current state. . . Hopefully by the holidays we can have a lot more done. It would be nice to be in the living room by Christmas, for Will’s first. Posted on September 21, 2011 Author KarynCategories Catchup, fireplace, inside, living room, nurseryTags fireplace, living room, nursery, Victorian9 Comments on You’ve been waiting! Well, we have been a while in writing. Our new son, born in February has taken up quite a bit of our time and energy. But, we have pushed on to complete his room and hopefully finish the living room by Thanksgiving. I took a short trip south this summer to give Bill some uninterrupted time to work on the nursery. As you may remember the walls needed a lot of plaster due to the fact that they were covered with a sanded paint and had some substantial cracking. 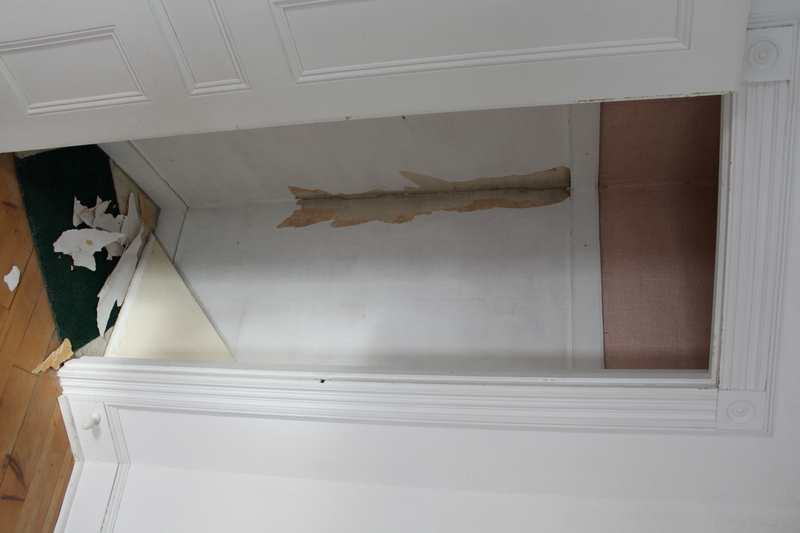 Before I left to go south, Bill had repaired a lot of the cracks, meshed the walls and put on at least one coat of plaster. 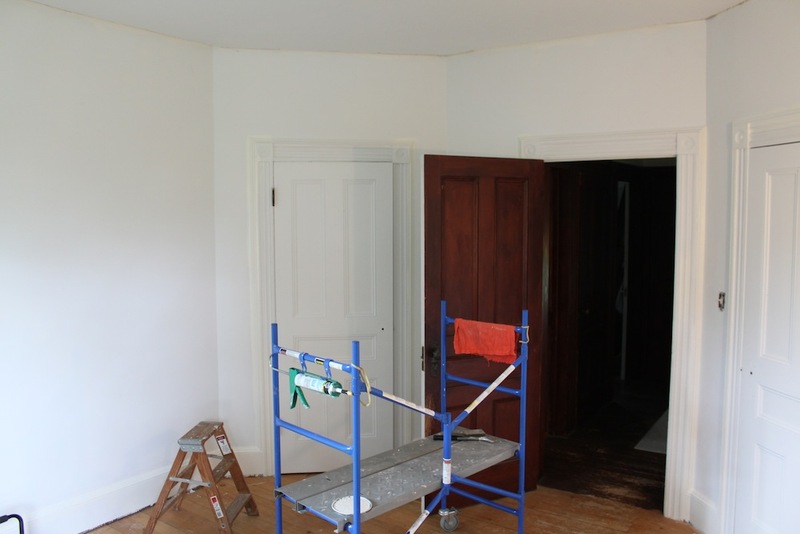 During the 10 days of my trip he managed to finish the plaster and sand the walls, apply sheet rock to the ceiling, tape and fill, caulk the woodwork, polish the hardware, scrape and paint the sashes, repair the sash cords and prime everything. Yeah, “wow” is right. And, he was working a full time job and doing classwork at the same time. 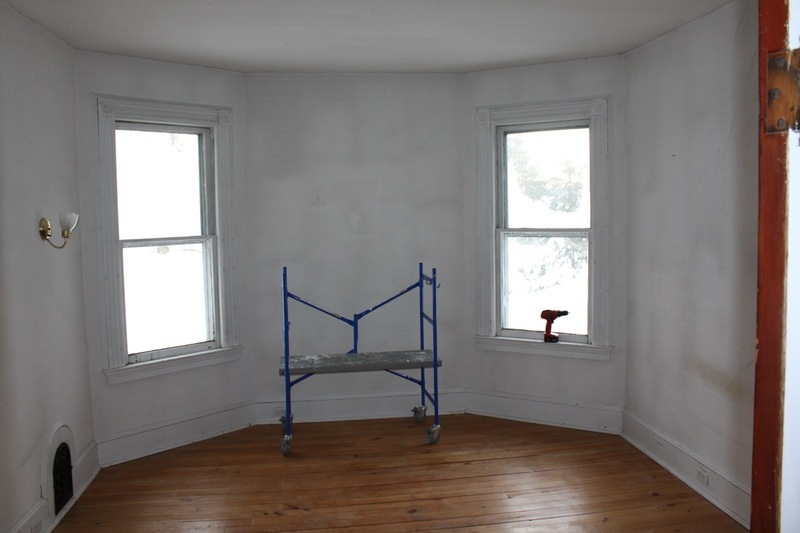 Upon my return, we have been able to paint the walls and trim. It is such a bright room that I didn’t want to use a dark color for our little guy, so I went with a pale robin’s egg blue. I’ve picked out new lighting which will arrive soon, too. I have planned to do some decorative painting in his room (in all my spare time), but I keep changing my mind as to what to do. Possibly a mural or a faux chair rail with a pattern underneath. This weekend we will put up crown moulding and finish the painting and then the following weekend we will begin on the floors. This floor has the least damage, so it should take very little to sand and stain. 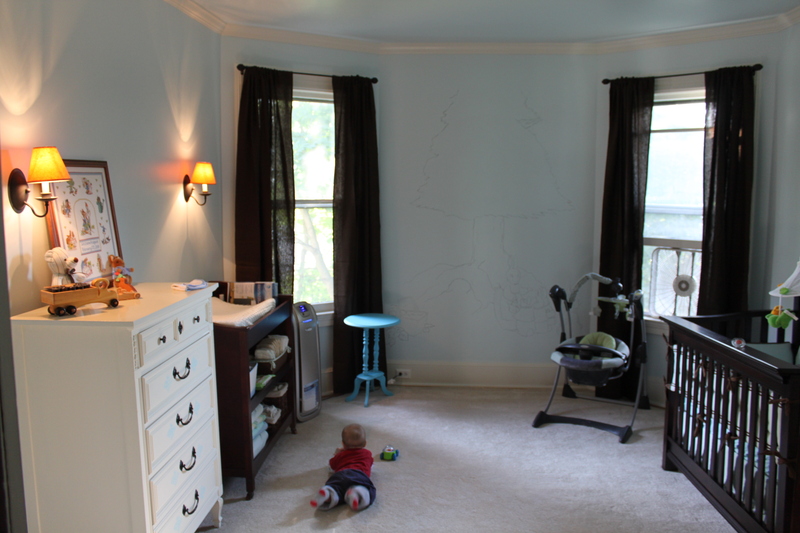 We have decided to use a water-borne stain and polyurethane in the nursery due to the fact that Will was very sensitive to the tung oil we used in the master bedroom. It won’t be as durable and a bit more difficult to maintain, but I’m finding the tung oil a beast of its own in that I can still smell the oil when I enter the room, and we finished that floor in January. Ah well, my writing time is short today. . . the young’un has awoken. I’ll be back to post finished photos when the room is complete. We are pricing out and starting to order materials for the baby’s room. As I mentioned in the last post, we’ll be putting sheet rock on the ceiling in here, so we’re going to order a shipment that will allow us to also have enough for 3 other rooms in the house. Once that arrives, Bill will be able to start prepping the room. Right now, we haven’t done anything to it except clear it of all furniture and decorations. An empty canvas if you will, ready and waiting. It is one of my favorite rooms in the house, so I’m looking forward to transforming it into a comfortable living space. While we are waiting on supplies, and giving ourselves a bit of renovation break waiting for the baby, here are some photos of the room completely bare. We haven’t really named this room anything as it has always just been “our bedroom”. In the rest of the rooms upstairs, we’ve had to call them by some sort of name to identify the differences, especially because we weren’t using any of them for the first six months or so after we moved in. 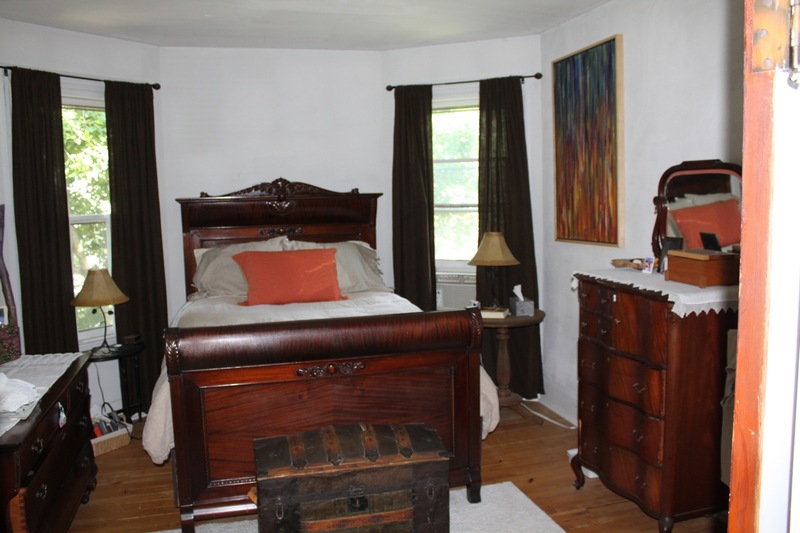 The “green room” became storage for the longest time, until it was converted into a true guest bedroom last May. The “blue room” became my studio for painting because I preferred its size to the other rooms. The “pink room” was always destined to be our Master bedroom, but it took a long time to get to call it “our bedroom”. 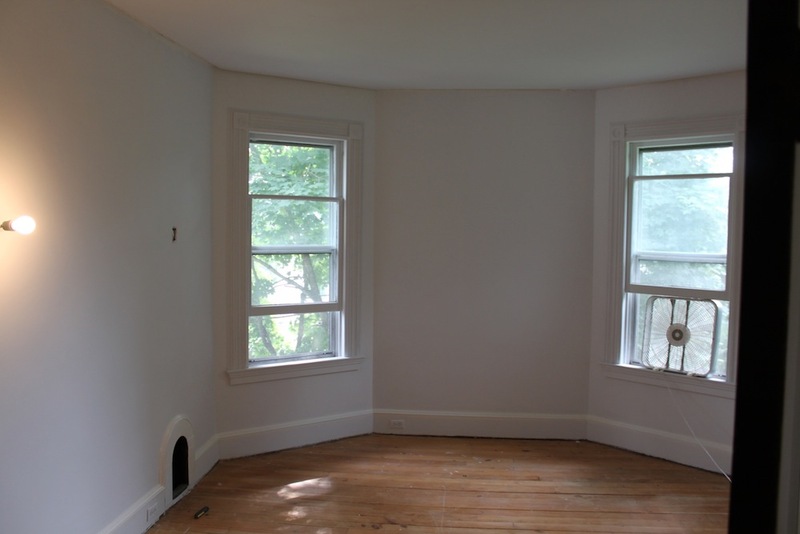 However, the white room or the octagon room has really gone nameless as it was just the bedroom. Now, it will become the nursery, but that name is a long way off from becoming a reality. You can see how we have used it in the past. We moved into this room because it was truly the cleanest bedroom when we bought the house. 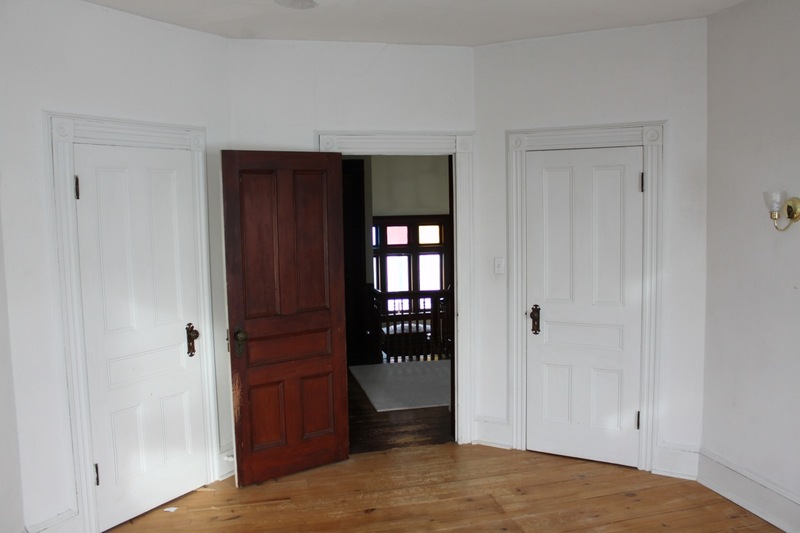 Though the walls are terribly cracked and painted with a sanded finish, the floors are in relatively good shape and the room was just better than the other options. There are also two small closets in this room on the corners, making it a full octagon. The windows opposite the closets are also on “corners”. It has been a comfortable quiet space to get used to sleeping in such a big house, and I will surely miss it. However, we have plans to move it right along for the baby, so we’ll walk you through the process once more on another bedroom. Bill is planning on putting up sheetrock on this ceiling. It was never our intent to use any sheetrock in the house, but we have discovered the hard way that the plaster cracks way too easily, and “un-does” a newly finished room. The dining room is a perfect example. Bill has done the ceiling in there twice, but it is cracking again from the joists between the floors. So, we’re going to put up sheetrock on the ceiling to keep our sanity. That is the first priority on the empty room. From there, we’ll go through the same process of repairing wall cracks, plastering walls, fixing windows, priming, painting, sanding the floor and finally refinishing the floor. I also took a close look this weekend into the closets to see what they will need. Each one is fully wallpapered and carpeted, which is weird considering they probably aren’t more than 3 square feet apiece. 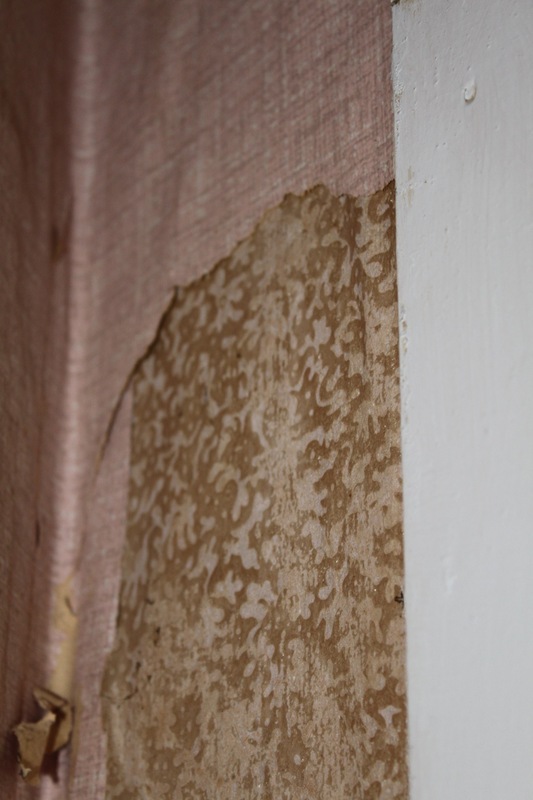 But, I may be able to get a sample of original wallpaper out of one of them to show you. We will post along the journey!